This demo shows realization of so popular HDR lightning, and also new rendering technique that is called Deferred shading. 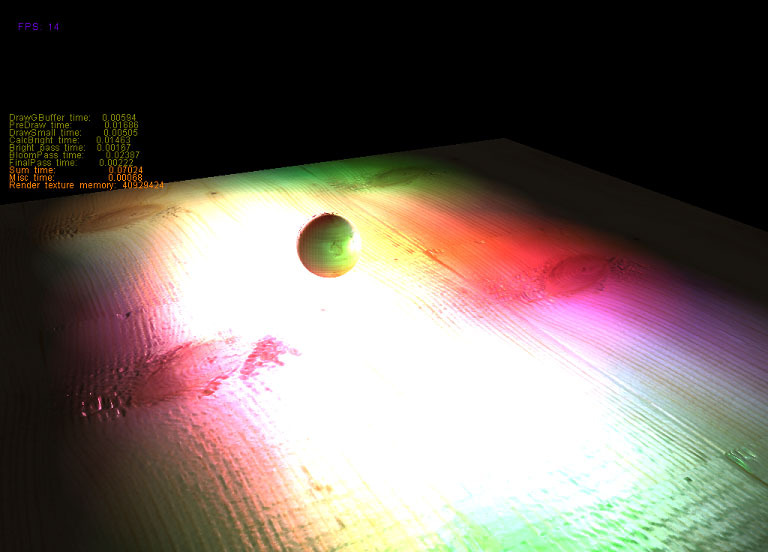 Deferred shading rendering means that we do not calculate lightning at the moment we draw mesh, but at different time. First, we are rendering some triangle information, such as position, normal, texture coordinates to an off-screen buffers (using Multiply Render Targets (MRT) to do this in just one pass). 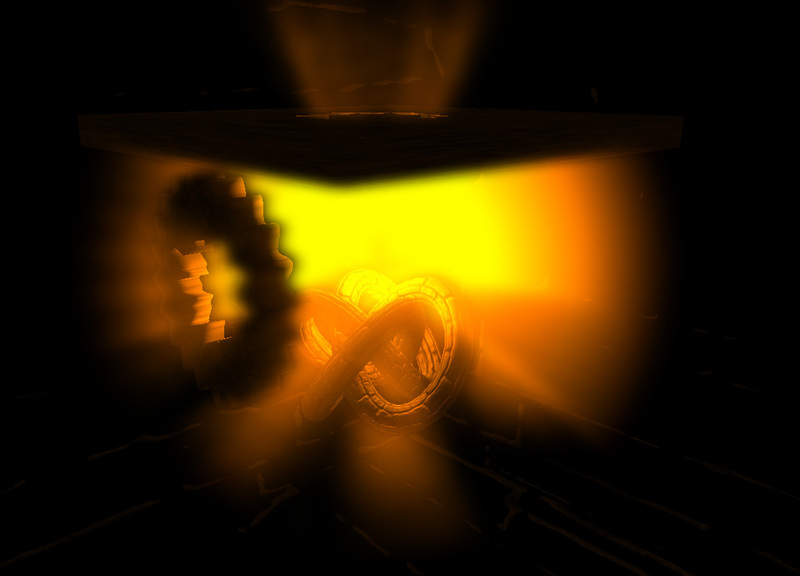 And then render full-screen quads with shader, that apply lightning, using information from textures. This technique is useful when we have a lot of dynamic lights in small area, and it will be to expensive to render all geometry in multiply passes. 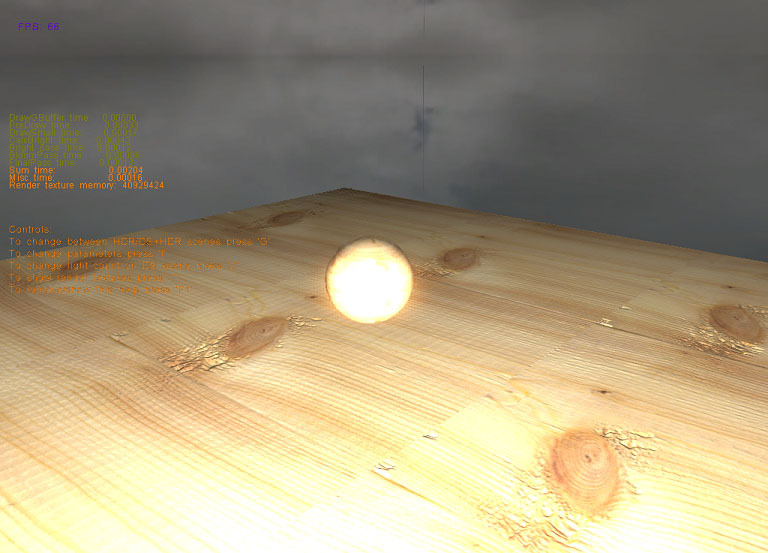 This demo also shows the effect of "human eye" to light adaption and Bloom post-filter to get glow from very bright points. This demo use float16 format textures, so to run this demo you need at least Radeon9500 and higher, GeForce6200 and higher. I created a demo that shows an effect of light in volume fog. This is imitation of light dispersion from a many little particles (dust, steam, etc) in air. Of course we cannot draw every particle, so I render some planes (20-50) next to each other, and apply lightning on them. To get rid of sharp edges and to hide the visible distance between planes, we are rendering these planes to an off-screen buffer, smaller than screen(256x256) and blur it. This step also makes glow for us. And finally there are shadows calculated for every plane, which increase visible effect of volume. To run this demo you need video card from Radeon9500 and higher, or GeForce5200 and higher.